The Chinese race delivered everything that qualifying promised - action from start to finish, changes in leadership (however briefly), a fight back through the field by Lewis Hamilton, and some frantic but fantastic midfield action. From the moments the light went out, there was barely a moment to blink as cars were battling for position throughout. Strategies were key, particularly as the safety car was called out at a key moment in the race. Traffic and overtaking occurred on the way in and out of the pit lane, and a first lap rivalry continued all the way through to the end of the race, onto the podium and into the press conference. Relive all the action with this FBFB replay. Nico Rosberg wins as chaos unfolds behind him. A first lap move by Kvyat sees Vettel collide with Räikkönen. Hamilton takes five pit stops but makes his way up to seventh. Ricciardo leads the race briefly before a puncture and a safety car for debris. No retirements throughout the race despite all the action. Hello everyone, welcome to the Factbyte Factbox for the Chinese Grand Prix. I think we might be in for an interesting couple of hours! It's Romain Grosjean's 30th birthday today, so many happy returns to the Frenchman. He might have hoped for more than 14th on the grid but hey, the team have made the most of their two races so far - today might also bring gifts for all! Someone who really does have a challenge on their hands is Lewis Hamilton. The defending champion was already facing a five place grid drop for a gearbox change before qualifying on Saturday. Then things went downhill when ERS issues stopped him setting a lap time. Naturally, the stewards have permitted him to race but he'll be starting from the rear of the field. Hamilton has the fastest car under him, and will no doubt make super progress early on but just how far can he climb today? No one has won this race from lower than sixth place before, so it might be tricky! Same three compounds available again in Shanghai, whites, yellows and reds. Daniel Ricciardo pulled out a stunning lap during Q3 yesterday to secure himself a spot on the front row of the grid. Even Christian Horner admitted he was surprised by the achievement. Tweet from @danielricciardo: "Awesome day. Start 2nd for tomorrow. Everyone thinks it must be the aerodynamic hair. I'm not superstitious but I may just keep it"
There's just a couple of minutes left before the pit lane closes. The cars have exited their garages, completed a couple of practice starts and are forming up on the grid. Drivers chatting with their engineers. Rio Haryanto: "It’s a long race, obviously we did some long runs in FP2 and the pace was not too bad. I’m looking forward to the whole race. It’s gonna be interesting how the tyres last. The key here is to manage the tyres and to get the right choice of the compound. I’ve just got to focus on my job and try to get a good start. I’m sure Lewis has a much better pace than us, I’ve just got to do a good job." Pascal Wehrlein also failed to qualify yesterday but is allowed to start. The Manor driver had a bit of an off, and says: "I think I was lucky that nothing more bad happened yesterday because it was quite quick. At the end it was just some small damage on the car." Max Verstappen: "Hopefully the problem with the car is fixed from quali yesterday, it all felt alright now. My car was pulling to the left on the straight, and when I was turning to the right. If we can manage the tyres well, because the track is quite hard on tyres, I think we had a chance to go forward." Drivers head to the front of the grid for the national anthem, ten minutes to go now. Looks like Hamilton didn't quite make it to the front for the national anthem. It is a long way to walk, I suppose! Jenson Button: "I was thinking one stop. There’s going to be a lot of different tyre options and strategies, I don’t think anyone knows what the best is. You’re disappointed not to get in Q3 but also we’re just outside the top ten so we can choose our tyres for the race, so hopefully we’ll make the best of that." Nico Hülkenberg picked up a three place penalty for the grid today, after his Force India was deemed to be released unsafely during qualifying yesterday. He starts 13th, but teammate Pérez is up in 7th ready to fight for some solid points. 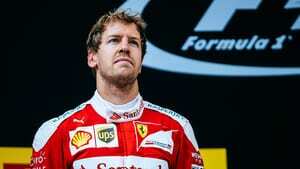 Tweet from @pirellisport: . @LewisHamilton has staged a fightback to the podium from the back before, notably in Hungary. Can he use tyre strategy to do the same? It's a hugely long back straight in Shanghai, so top speeds coming out of those engines. There's some heavy braking around the track, harsh on those components as well. Temperatures a little higher than expected, there's a lot going on for the strategists and engineers to think about. All the drivers are starting on soft or supersoft tyres. We've got the first nine drivers on the red supersofts. Massa and Alonso on softs with Button and Hülkenberg choosing the supersofts. The rest of the field are all on the yellows except for Kevin Magnussen, starting 17th, with the reds bolted on his Renault. The mechanics rip off the tyre blankets and dash to the side of the grid, as the formation lap gets underway. Rosberg rounds the final corner and pulls slowly along the grid to find his front row spot. The rest of the field files in neatly behind him. Both Rosberg and Ricciardo get a great start but the Red Bull has the advantage into the first corner. Kvyat also zoomed up to slip into third place. The two Ferraris appeared to collide into the first corner which has knocked them both way down. Vettel is down in 8th, Räikkönen way down in 20th before the Finn heads into the pit lane. "Had no chance to avoid, had the Red Bull coming up the inside like a mad man," says Vettel. Grosjean and Hamilton have both also come into the pit lane at this early stage. Lots of front wing missing on that Ferrari, as Vettel moves ahead of Felipe Massa to take seventh. Button also muscles his way through pushing the Williams down two places in one corner. A puncture for Ricciardo down the long back straight. Rosberg easily sweeps past, as does Kvyat. Daniel quickly dives into the pit lane. It was a relatively good place for that to happen, just a couple of corners and the Red Bull was back in the pit lane. Rosberg is up in the lead, then, the safety car waiting for him at the first corner. SO MANY CARS IN THE PIT LANE. A new nose goes on the Ferrari of Sebastian Vettel. Long train of cars go into the pit lane, long train of cars come out again. Replays of the first corner madness show just how much debris is littered across the track. It's a surprise the safety car wasn't called earlier. More replays, show that Kvyat wasn't really being a mad men when he moved up the side of Vettel. The German was just surprised, bumped into his teammate, pushing Kimi off track. When the Finn rejoined, he caught the rear wheel of a Force India and squeezed a Sauber into Hamilton. Sergio Marchionne is in the Ferrari garage, awkward time to make some first lap chaos Seb. Hamilton has come in for a new set of tyres and has been sent on his way again. Meanwhile, those drivers that haven't pitted: Rosberg, Massa, Alonso, Wehrlein, Gutiérrez, Palmer and Haryanto. That's Wehrlein up in fourth place, by the way. Team radio to Lewis Hamilton: "We have a plan. Nothing wrong. All part of the plan." "So I'm boxing again now?" Hamilton says as he dives into the pit lane AGAIN. Softs go on the Mercedes now. Replays show so much traffic coming into the pit lane during that busy period. Vettel got frustrated on the entrance and overtook several cars on his way in! Also Button had to take some avoiding action as the traffic bunched right up, narrowly avoiding a crash. The chief strategist at Mercedes is sitting on the pit wall, hands rubbing his forehead with stress. He very much looks like a man doing some maths. It's a clean restart, with Rosberg and Massa ahead and away. Fernando Alonso quite easily gets past Wehrlein who is likely going to have to get used to that sinking feeling from here. Team radio from Vettel earlier, as he continues to explain: "Just to copy you again, Kvyat's attack was suicidal. There was always gonna be a crash, no way with the speed he had he could have done the corner." Button passed Palmer, whilst the Renault was losing out to the McLaren he took his eyes off Vettel who also swept past. Meanwhile, Magnussen loses out to Hamilton. Bad couple of minutes for Renault. There's a train forming behind Wehrlein now, he's got Gutiérrez and Pérez hunting him. Bottas also close with Vettel waiting to pounce slightly further back. Daniil Kvyat has put himself in a good position, up in third and the highest driver to have pitted. Vettel is on a mission, he's passed Bottas for eighth. Then Gutiérrez for seventh. Wehrlein is next in line, after the Manor dropped back behind Pérez. That should be easy pickings for the Ferrari. Alonso hasn't been into the pits yet, and he reports from fourth place: "All four tyres are graining, let's see in the next couple of laps." Amazingly, amongst all the carnage, there have been no retirements yet. Ricciardo and Hamilton are doing battle now. Ricciardo denies him at first, and gets a moment to breath when he puts a Haas between them. Hamilton quickly dispatches Gutiérrez though and moves alongside the Red Bull. Vettel flies past Pérez down the home straight. Up to fifth for the Ferrari as he continues to recover from the first lap incident. Tweet from @EliGP: I like how there were so many incidents, they didn't investigate a single one. Vettel has the pace down the back straight to easily pass Alonso, but the Spaniard won't give it up too easily as he makes a move into the braking zone - of course it doesn't come off but good efforts. The slippery surface flag is waved at the final corner. Lewis Hamilton passes Jenson Button to move into the top ten. Yellow flags are waved as a brave marshall dashes out on track to recover bits of Sebastian Vettel's front wing that flew off a couple of laps ago. Alonso comes into the pit lane, medium tyres go on the McLaren. A straightforward second stop for Vettel. Just tyres, no front wing change for the German. There's a spot of carbon fibre lodged on the nose of Ricciardo's helmet, it's moving about a bit but not dislodging. That's got to be annoying. Kvyat comes into the pit lane for his second stop of the day. Tweet from @Racing_Reporter: Vettel shows the pace difference between old and new soft tyres, after his stop he's two seconds faster than leader Rosberg. Race leader, Nico Rosberg (yes, he's still there), heads in and out of the pit lane and retains his lead. Still on the soft tyres. Incident involving Nico Hülkenberg under investigation - driving unnecessarily slowly in the pit lane. Incident involving Sergio Pérez will be investigated after the race - unsafe release. Sainz and Ricciardo make a double Red Bull assault on Fernando Alonso, dropping the McLaren down to 11th. Lewis Hamilton heads into the pit lane again, that's four stops for the Mercedes driver so far. 5 second time penalty for Nico Hülkenberg - driving unnecessarily slowly in the pit entry. Ricciardo and Sainz continue their path through the field, although Daniel has got ahead of the Toro Rosso now. They've both passed Ericsson to move up to eighth and ninth respectively. Button is running on twenty lap old medium tyres, whilst all around him are on softs. He's only pitted once this afternoon, so it'll be interesting to see what he moves onto next. Hamilton is chasing Räikkönen for 10th place - a battle we had anticipated at some point today! Team radio from Nico Hülkenberg: "Maybe it's time to think about that alternate strategy guys, think about it." Sergio Pérez in the Force India makes a move on Jenson Button. The McLaren defends as best he can but Pérez sticks it around the outside and hustles onwards for fifth place. Bottas is next up to hound the McLaren. Bottas easily makes the move on Jenson, and Ricciardo is next in line. Might be time to start thinking about fresh tyres for Button. Button does come in to the pit lane for a fresh set of mediums. Hamilton has hauled his way back into the top ten. Into the points despite his team's best efforts! Team radio to Jenson Button: "Okay, Jenson, you know what we're trying to do." He might, but we don't! Are they going to risk a two-stopper? Rosberg is pulling out enough of a gap in the lead to be able to pit without penalty soon. Meanwhile, Pérez comes in for his third stop of the day. Tweet from @ForceIndiaF1: Hard to believe we have just passed the halfway point - it's been an entertaining race so far! Valtteri Bottas and Lewis Hamilton come into the pit lane - that's a fifth stop for the Mercedes driver. Medium tyres go onto Hamilton's car. Is he done with pitting now, or will he make it six? Vettel is closing up on the Red Bull ahead, that worrying moment when you see the flashes of red Ferrari in your wing mirrors down the back straight. Räikkönen was chasing Sainz, but the Toro Rosso driver pitted, freeing Kimi to head off after the podium three. Lewis Hamilton is on a charge now that he's finished pit-stopping. He passes Sergio Pérez to move up to ninth. Super slo-mo shots show Rosberg's front left tyre is graining pretty badly now. He's got over 40 seconds on the next car, so a pit stop shouldn't cost him anything. The battle between Kvyat and Vettel moved into the pit lane as both came in for their third stops at the same time. They emerge in the same order. Kvyat and Vettel, nemeses from the first corner crash, are in a tight battle now, with Räikkönen waiting behind. Rosberg does come into the pit lane from the lead. Super quick stop by the Mercedes crew and out he goes again, still in P1. Vettel pulled out alongside Kvyat, swept past and cut right back in front of the Red Bull - a bit of a swipe ref the first corner? Up to third for the Ferrari now, anyway. Ricciardo and Räikkönen pit simultaneously, which promotes their teammates up to podium positions. Fastest lap of the race so far - Nico Rosberg, 1:40.418. Felipe Massa makes a move on Max Verstappen, looking for fourth place. The Toro Rosso drops into a Williams sandwich, with Valtteri Bottas in his mirrors. Lewis Hamilton is at the rear of this battle as well. Lewis Hamilton makes an overtaking move on Bottas at turn nine. It was an amazing move, perhaps squeezing the Williams a little too wide, but another position made for Lewis. Ricciardo sweeps past Bottas as well, another move at the end of the main straight for the Red Bull. Team radio to Daniil Kvyat: "You're lapping Palmer ahead." "He should get out of my f***ing way." An incredible move from Daniel Ricciardo sees the Red Bull slide up the inside of the Mercedes ahead, Lewis Hamilton too busy concentrating on Massa ahead. Up to fifth for Ricciardo now. A few seconds later and Ricciardo takes the inside line at the hairpin to pass Massa as well. Up to fourth. Williams about to lose out again as Kimi Räikkönen feints a move on Bottas, and then makes the pass on the inside. Seventh for the Finn. Räikkönen heads up to join the Hamilton/Massa battle in front of him. Hamilton just can't see a way past the Williams of Felipe Massa, the Brazilian making his car a lot wider than Bottas did. Hamilton takes to the inside, but locks up and doesn't have the pace out of the corner to move ahead of the Williams. Massa still ahead. Räikkönen hauls his Ferrari up alongside Hamilton, it looks like he doesn't have the grunt to get ahead, but into the corner he has the inside line. Lewis can barely do anything to keep the Ferrari behind and he loses the position. Massa will breathe a sigh of relief! Less of a sigh of relief, actually, as Räikkönen sweeps past Massa for fifth place. The crew in the Ferrari garage let out a cheer, and Sergio Marchionne cracks a smile. Slightly more random fastest laps coming in now as Romain Grosjean posts 1:39.923 - from 19th place. With Kimi's move, that puts Massa back in front of Lewis Hamilton, and the gap has just dropped below a second. Phew, it all seems to have calmed down now. Five laps to go. Esteban Gutiérrez has passed Marcus Ericsson, but both are a lap down and that was for 14th place. It feels as though Hamilton might have backed off a little though, he's got to make his tyres last to the end, of course. Verstappen is just over a second away from Bottas, and is closing in on the Williams for 8th place. Team radio from Jenson Button: "Tyres are shot, tyres are done." Alonso sits 12th, Button 13th. Bottas tried to defend from Verstappen but ran wide and allowed the Toro Rosso through. Old tyres, dirty track, difficult times. Grosjean asks the team if he should retire the car, "there's something wrong, it's undriveable today." He's told to just wait out the next two laps, nearly there now. Nico Rosberg wins the Chinese Grand Prix! Vettel follows behind for second place, and Daniil Kvyat hangs on to third place for a trophy. Hamilton manages to pick up seventh place, which is some damage control but won't appease him, I think. The German congratulates and thanks the team for a car with the best balance ever! The Ferrari pit wall congratulates Sebastian Vettel on a solid second place, and he once again apologises and explains away the first lap incident. This is a man who knows his boss is watching on. Vettel and Rosberg speaking a bit of German between themselves in pre-podium room. Rosberg having a good look at the times, before grinning into the camera. Vettel spots Kvyat and immediately turns on him. "You! What happened at the start, you come through and all three of us go out!" Kvyat defends himself by saying "It's racing." Three drivers take to the podium and the German national anthem plays out. Champaaaaaagne. Kvyat aims his right in Vettel's face. Podium quotes - Nico Rosberg: "Start was not quite good enough, Daniel got a really good one. But a really quick car today, feeling great, attacked him straight away and managed to pull a great gap after that. I didn’t see anything behind me, I just know the gap and that I have to extend it as much as possible. I’m glad it worked out." Podium quotes - Sebastian Vettel: "Obviously it’s difficult to judge how it looked from Kvyat’s point of view. My start was not so great, Kimi locked up, I went on the inside. Daniil was trying to do the same thing as me but then Kimi came back so I was in the middle. I was surprised, I had to steer left at the same time Kimi was coming across, so we made contact, which is in a shame. In the end we were lucky, it’s not the best result for the team. After that it was an entertaining race, lot of cars I had to overtake, it was good fun. Big thanks to all the team, and to the Chinese fans." Podium quotes - Daniil Kvyat: "I had a really good start, you see the gap, you go for it on the inside. You see one car, you don’t see both cars. It was a risky move, I agree with Seb, but these kinds of moves get you on the podium. I’m on the podium, he’s on the podium, it’s fine. I will try these moves again so everyone should expect that." Lewis Hamilton: "It was definitely a difficult one. I got a good start, it’s always difficult starting at the back. I tried to avoid what was happening ahead of me but got tangled in it. After that I was just trying to battle my way through, but every time I did a stop I had to battle again. At the end I had to look after the tyres. But that’s racing, onwards and upwards." No retirements at all in that race, which is impressive considering how many incidents there were throughout. Vettel: You, asking what happened at the start. You crash into us. Vettel: No well. You came like a torpedo. Vettel: That’s racing! if I keep going the same line, we crash. Kvyat: Then don’t keep going. What an amazing race that was! Qualifying set it up to be awesome, but I wasn't convinced. It proved me wrong, though, and delivered pretty much end-to-end entertainment. Another solid weekend for Nico Rosberg, how long can he keep this streak going before Hamilton starts to come back at him? The battle for the rest of the top ten places was fierce and brilliant. Loving the difference of opinion between Vettel and Kvyat, a good rivalry always fires things up, and well done Daniil for not being cowed by a four times world champion. Disappointing weekend for Haas after their solid start to the season, but it was always going to tail off at some point. Hopefully they can pick themselves up and keep pushing for better things. Not the birthday present Grosjean would have wanted. McLaren have been frustratingly just out of the competition for the whole weekend. Alonso's anguished cries after missing out in qualifying will likely happen again today. 12th and 13th for the pair, no points yet. But the team have to be buoyed that they are improving on last year, all the time. We've got two weeks now before the Russian Grand Prix, the relatively new race moving way up the calendar to become the fourth round of the season. 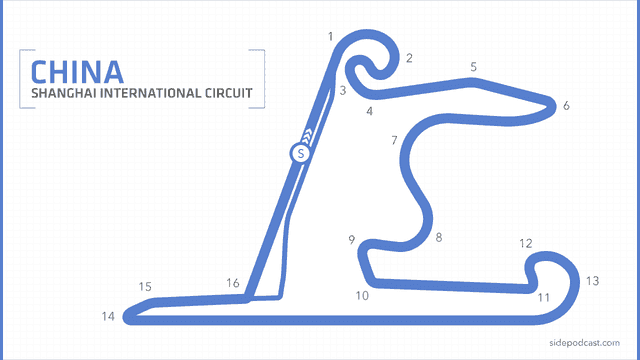 Although it doesn't promise much as a race track, I still can't wait to see what happens in the next F1 outing! See you then!